Adobe has joined a growing list of firms offering web-based alternatives to conventional office programs. Similar programs are already offered as elements of other free office software suites from Google, ajax13 and Zoho. Microsoft has also announced a new web feature for its Office suite which lets people access documents online. Microsoft Office Live Workspace is currently being offered as free test, or "beta", software. "Office Live Workspace will provide anywhere-access to Office documents, including Word, Excel and PowerPoint files," said Jeff Raikes, president of Microsoft's Business division. "In other words, these documents will go wherever people go when they're away from their usual desktop." People using the new feature will be able to post documents directly to an online workspace where friends or colleagues can be invited to collaborate on a document. The new services from both companies are part of a wider trend to offer applications on demand and online. In addition, many companies also offer their standard applications for free. "Companies are looking at this as a real paradigm change," said Michael Silver of analyst firm Gartner. The market for these applications was still small, he said, particularly compared to the dominance of Microsoft Office on computer desktops. However, he said, that would start to change. "Companies need to position themselves today to be leaders in the area as it develops." Google has already established itself as one of the major players offering free programs that allow users to create documents, spreadsheets and presentations online. While mainly aimed at individuals, Google also offers a business, or "enterprise", version that comes with technical support to help people use it. Google has developed its software suite by acquiring companies such as the internet start-up Writely, which developed its word processing application. Adobe appears to be following a similar path, having acquired Buzzword by buying its developer, Virtual Ubiquity. The firm has offered the word processor as a limited trial since May 2007. "We were inspired by the way today's youth spend their lives working and playing together online, and how this is influencing the way we all think about collaboration," said Rick Treitman, CEO of the firm. Although there is a move towards increasingly hosting applications online, many people still demand an ability to work with documents when there is no web connection. In May this year, Google announced its Gears tool that allows users access to online data and applications inside a web browser even when the PC is offline. Using Gears, online data that is usually held on web servers is stored on an individual's computer, and then synchronised when the user logs back on to the web. 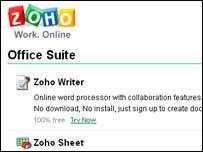 The developers of the free online office package Zoho use Gears to allow users to work offline. Adobe has said that a similar service will be available for Buzzword at a later date. 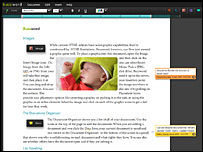 It also plans to integrate a new file-sharing feature called Adobe Share with the online word processor. Share allows people to store up to 1GB of documents online or embed them in any web page, from which anyone can download and print a PDF. The service is currently being offered as part of a trial.